So, I’ve been a little quiet on the blog front this week, and I apologize for that. I have two main reasons for that: 1) It seems like all of the cards I’ve made the last week or so haven’t really been “blog-worthy,” though if you follow me on Instagram, you’ll probably have seen some of them. The ideas I’ve had buzzing in my head have either taken forever to finish, or they just haven’t come out quite right. 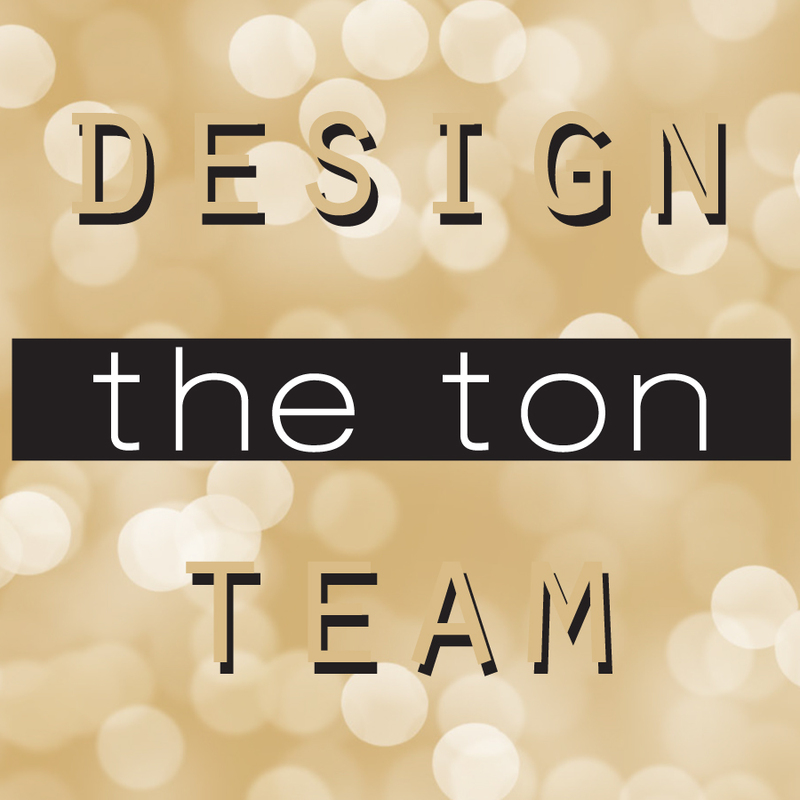 And reason #2 is the reason I have check-to-see-if-I’m-dreaming pinch marks all over my arms (not really, but I did kinda beat my husband up out of excitement when I got the email): I was asked to be a member of The Ton’s Design Team!!! If you’ve followed me for the last year, you’ve noticed that I, like so many others, have a slight obsession with The Ton’s stamps. Like, I had to restrain myself from using them on every.single.card. The super classy style of all of this company’s products have been right up my alley. And the coloring options… oh my peas! Seriously, they’re awesome. This A7 card is a monster compared to my normal A2 cards. 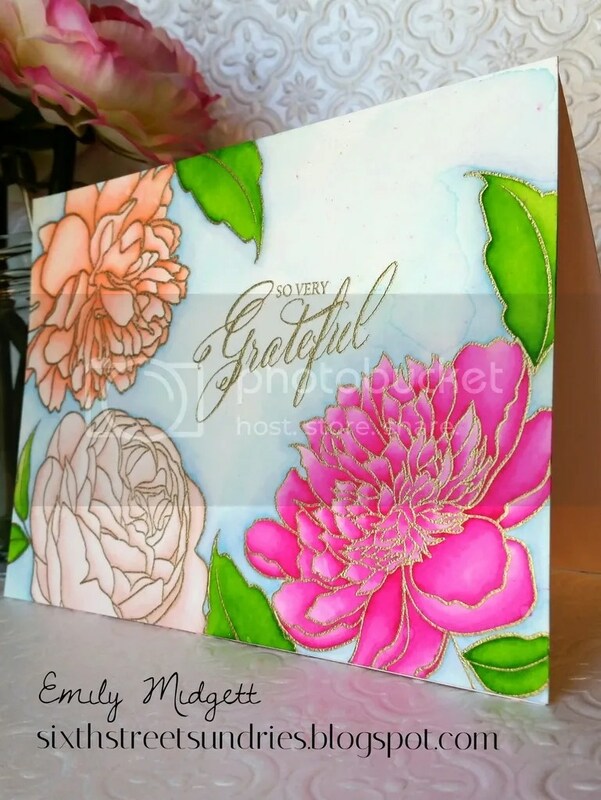 I thought it was an excellent size to fully utilize all of those absolutely stunning Large Peony 1, 2, & 3 sets. (I’ve linked to each individual set, because there are three of them.) Each flower is so stunning that I had to have them all. Some people (ahem, my husband) might ask why I needed all three. Because, dear. Because. Just look at them all together!!! Gah! Anyhow, I heat embossed them in gold on my favorite Strathmore watercolor card stock, then got to work coloring them with my handy-dandy Zig Clean Color markers, water, and paintbrush. Wow, this is stunning! 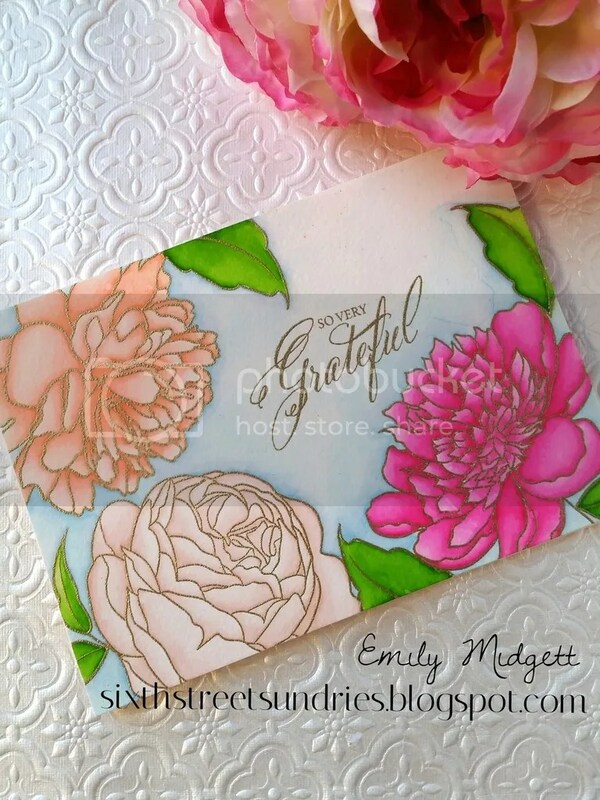 Ha, when I first saw it I was like wow that's some intricate coloring on small stamps….then I realized you used that large stamps…that is a big card! 😉 But anyway, congrats again…looking forward to working with you! Congratulations!!! You belong on this team!! You are so deserving!!! I am hoping for some videos. 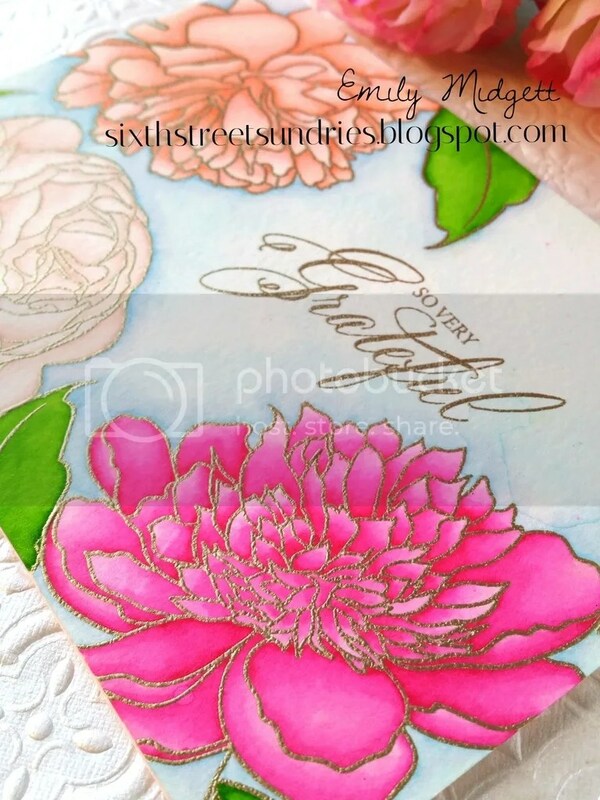 I have not purchased the peonies because i do not think have the skills to color them. I am hoping you can teach me, please.